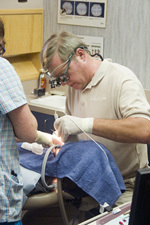 Q: Will I be totally "out" for my dental treatment if I elect to use conscious sedation? A:No, conscious sedation will not put you totally under or "out" for dental treatment. It is a possibility that you may go to sleep but you will not be unconscious. A good description for conscious sedation is that you are aware of what is happening to you, it's just that you are in a dream like state. Because of the type of oral medication that we will have you use, it is possible that you will not even remember having had dental treatment or being in our office since it has an amnesia effect. Q: How will I feel when I am under conscious sedation? A: Most patients find that they are very comfortable, relaxed and tend to go to sleep which makes their dental appointment seem very short and quite enjoyable. Q: Does Dr. Pybus have any special training to use conscious sedation in his office? A: Yes, Dr. Pybus, as required by the Texas Dental Association, is certified to use local anesthesia, Nitrous Oxide, and oral sedation alone or in combination with each other. In addition, Dr. Pybus and all staff members are certified in CPR for additional patient safety. While having conscious sedation in our office, our patients have the following vital statistics monitored during treatment: pulse oximetry, blood pressure, and heart rate. Q: Can I drive myself to my appointment if I have elected to use conscious sedation for my dental treatment? A: If you are electing to only use Nitrous Oxide, (and of course a local anesthesia) during your treatment, you may drive yourself to and from your dental appointment. This is because the entire effects of the Nitrous Oxide can be reversed in our office by having you breathe oxygen for a minimum of 5 minutes once your treatment has been completed. You should have no residual effects from the Nitrous Oxide and therefore can drive your own car. If, however, you have elected to use any type of oral sedation with or without the Nitrous Oxide, you must have someone drive you to and from your dental appointment because we cannot reverse the effects of the oral medication while you are in the office. If you are taking an oral medication for your treatment, you will need to take it at least one hour prior to your appointment time (so the medication has time to take effect) and because the medication will be working in your system, you will be unable to drive yourself to your appointment.